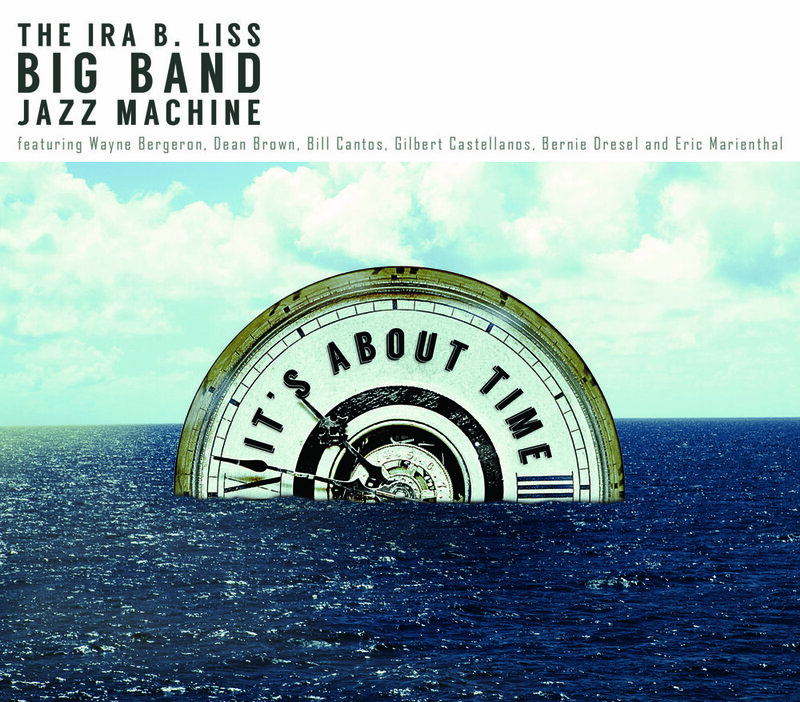 The Ira B. Liss Big Band Jazz Machine is proud to announce the worldwide release of their 4th CD, “It’s About Time” on August 5, 2013. The CD features internationally famous jazz artists Wayne Bergeron, Gilbert Castellanos, Eric Marienthal, Bernie Dresel, Bill Cantos,and Dean Brown. With stellar compositions by Alan Baylock, Chris Braymen, Bill Cantos, Mike Crotty, Peter Herbolzheimer, Maynard Ferguson, Ray Brown and Rob Vuono. While the big band era ended nearly seventy years ago, and the number of fulltime jazz orchestras around today can practically be counted on one hand, there are many world class part-time big bands with each major city seeming to have at least a few. The Ira B. Liss Big Band Jazz Machine from San Diego, which was founded in 1979, can hold its own with most of its contemporaries. Comprised of the standard eight brass (four trumpets and four trombones), five saxophones and three rhythm plus two singers, Liss’ big band also welcomes a few guests on a song or two apiece. Of those, guitarist Dean Brown is impressive on Wes Montgomery’s “Four On Six,” altoist Eric Marienthal plays beautifully on the ballad “Sally ‘O’,” trumpeter Gilbert Castellano is featured on “Softly As In A Morning Sunrise,” and everyone’s favorite lead trumpeter Wayne Bergeron brings back the spirit of Maynard Ferguson on the world premiere of “Glory, Glory,” a piece co-written by Ferguson. The core band also has plenty of chances to shine on these arrangements, the majority of which were written by Chris Braymen or Alan Baylock. Several of the musicians have solo space but it is the powerful ensembles and the spirit of the band that are most memorable. Lovers of modern swinging big bands will definitely want to pick up It’s About Time, which is available from CDBaby, Amazon, iTunes and www.bigbandjazzmachine.com. Live at the Bernardo Winery!